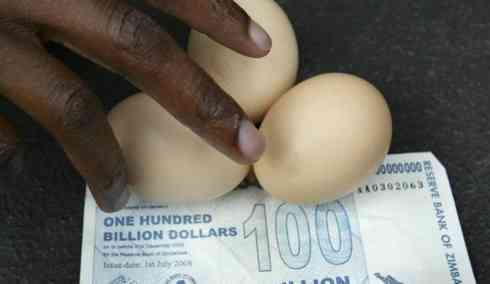 Home > Dollar, Food Crisis	> Zimbabwe Hyperinflation comming soon to AMERICA? 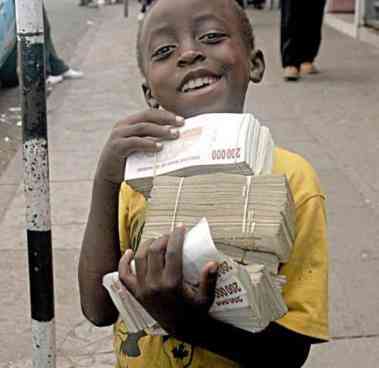 Zimbabwe Hyperinflation comming soon to AMERICA? In November 2008 inflation in Zimbabwe hit 89.7 sextillion percent – that is 89 700 000 000 000 000 000 000%. To get a rough idea how much that is – a sextillion is a billion trillions.In addition to the staggering hyperinflation, unemployment in Zimbabwe also went up to 85% and over the third of the people left the country. Check out the pictures below to get an idea how was life in Zimbabwe during the hyperinflation. Zimbabwe’s inflation is hardly history’s worst — in Weimar, Germany in 1923, prices quadrupled each month, compared with doubling about once every three or four months in Zimbabwe. That said, experts agree that Zimbabwe’s inflation is currently the world’s highest, and has been for some time. Could this happen to America in the near future? Fact: Hyperinflation has occurred in 30 nations within the last 100 years. Either America Or China Will Crash In 2011 Are you prepared for a emergency?